Distributor: Currently licensed by Shout Factory. Notes: Based on manga by Fumiyo Kouno. Directed by Sunao Katabuchi. 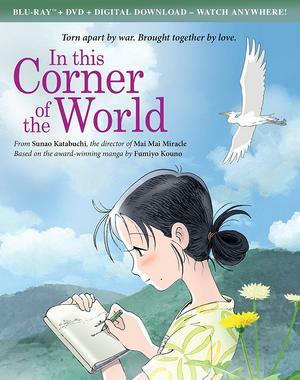 Suzu is a young woman from Hiroshima who finds herself abruptly coerced into marrying a man named Shusaku Houjo, and to move in with his family in Kure. But soon there's a war on, and as the American forces drive inexorably closer to Japan, the deprivations- and the horrors- of war increasingly become part of her personal experience. When I read "Hiroshima" in the box copy of this OVA, I thought we were going to get another Barefoot Gen-style anime that was preoccupied with the horrors specific to the nuclear bombing of that place, but In This Corner of the World is much, MUCH more than that; and while the war IS unspeakably cruel to Suzu, it is, in the end, perhaps less so to her than to others. The show talks about the importance of our decisions, and yet seems to in fact demonstrate that pure chance is such a strong determinant of our fate that even making the "right" decisions doesn't guarantee that one can escape unscathed. Shusaku, for his part, tries to treat her with some kindness and tenderness. He also clearly feels some guilt over making her marry a total stranger. (Her first question to him, on their wedding night: "Have we met before?") The remorse he feels gets demonstrated in what we'll call an utterly fascinating (and perhaps misguided) act of generosity when they later have a houseguest. (That houseguest, by the way, has apparently experienced a 180-degree turnaround in personality since we first met them near the beginning of the show.) As is often true of the best fiction, the characters' personalities are conveyed by their actions as much as by their words. And then there's Keiko, Shusaku's sister. Cast out by her husband's family after his death ("traditional society" thing, again), she moves back in with her family- including her brother and his new bride. She seems to develop an instant dislike for Suzu- apparently because Suzu doesn't seem all that interesting to HER- and things will get REALLY strained later. However, the rest of Shusaku's family pretty consistently supports Suzu. The show is excellent at capturing the ambivalence of the civilians toward the military (and the paranoia of the military toward civilians, too.) There's a marvelous scene where a group of women are patriotically congratulating a young draftee, then turn around so he can't see the looks of horror on their faces- by this stage of the war, everyone knew that these young men would almost certainly die-and the "front" had already moved from distant shores, into (literally) their own backyards. Recommended Audience: MPAA rating is PG-13, for war violence and mature situations.